“This study demonstrates the power of leveraging smart technology to improve the care of people with cancer. These tools helped simplify care for both patients and their care providers by enabling emerging side effects to be identified and addressed quickly and efficiently to ease the burden of treatment. I hope that these or similar technologies will be broadly available to patients soon,” said ASCO President Bruce E. Johnson, MD, FASCO. ALEXANDRIA, Va. – A federally funded, randomized clinical trial of 357 people receiving radiation for head and neck cancer, using mobile and sensor technology to remotely monitor patient symptoms, resulted in less severe symptoms related to both the cancer and its treatment (both general and cancer-related). Patients who used the technology – which included a Bluetooth-enabled weight scale, Bluetooth-enabled blood pressure cuff, and mobile tablet with a symptom-tracking app that sent information directly to their physician each weekday – had lower symptom severity than participants who had standard weekly visits with their doctors. In addition, daily remote tracking of patient wellbeing, according to the researchers, enabled physicians to detect concerning symptoms early and respond more rapidly, compared to usual care. These findings will be presented at the upcoming 2018 ASCO Annual Meeting in Chicago. An estimated 51,540 new head and neck cancers will be diagnosed in the United States in 2018.1 Just over 10,000 people are expected to die of the disease, with men accounting for three-quarters of these deaths. Most people diagnosed with this form of cancer receive radiation therapy but can also have chemotherapy or surgery. One of the major side effects of treatment that requires careful monitoring is pain and difficulty swallowing, which can lead to dehydration. This trial used a technology system called CYCORE (CYberinfrastructure for COmparative Effectiveness REsearch), developed collaboratively by four institutions through a grant from the National Cancer Institute. Participants were randomly assigned to CYCORE (169 people) or usual care (188 people), which consisted of weekly doctor visits. People in the CYCORE group received sensors (blood pressure cuffs and weight scales) that were Bluetooth-enabled. They also got mobile tablets with proprietary Wi-Fi. An in-home wide area network (WAN) hub/router transmitted their sensor readouts, and a mobile app transmitted their symptom data through a back-end cyber-infrastructure to secure firewall-protected computers at MD Anderson to ensure patient information confidentiality. 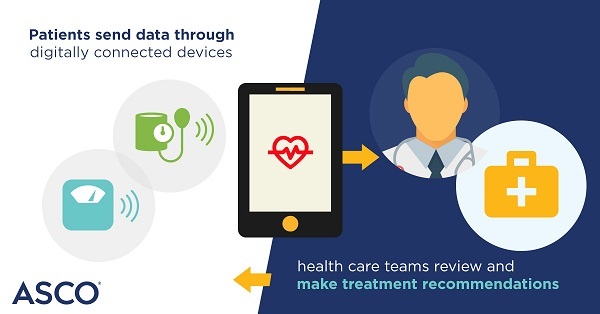 For the CYCORE group, physicians reviewed data from the app and sensor transmissions remotely each weekday and could intervene in a person’s care if necessary. Both CYCORE and usual care participants had weekly in-person doctor visits. At the start of radiation therapy, study participants completed a 28-item MD Anderson Symptom Inventory survey about their health and common activities of daily living. The survey covered general symptoms that are common in people with cancer, such as pain, fatigue, and nausea, as well as symptoms that are particularly relevant to people with head and neck cancer, such as difficulty swallowing or chewing, skin pain/burning/rash, and problems with tasting food. The participants completed a similar survey at the end of their radiation therapy, usually 6 to 7 weeks later. A final survey was completed 6 to 8 weeks after their radiation therapy ended. There was no difference in self-reported health severity scores between the CYCORE participants and those who received usual care at the start of the trial. Symptoms severity was scored on a scale of 0 to 10, with zero being no symptom or pain and 10 being the highest level of symptom severity. After completion of radiation therapy, the CYCORE participants had lower (i.e. better) mean scores for general symptoms vs. usual care participants (2.9 vs. 3.4), as well as lower mean scores for symptoms specific to head and neck cancer (4.2 vs. 4.8). Six to 8 weeks after completion of therapy, CYCORE participants had a mean score of 1.6 vs. 1.9 for usual care participants based on overall health. Both groups had slightly higher severity scores for specific head and neck symptoms (1.7 vs. 2.1). Most patients (80% or more) adhered to daily monitoring, which was an excellent outcome given the intensity of their treatments, noted Dr. Peterson. Scores reflecting how various symptoms interfered in activities of daily living were about the same in both groups across the entire time of survey reporting. While the authors were able to recruit people from a wide range of ages, the study population was mostly white, which closely reflected the overall head and neck patient population at the cancer center. The next step for researchers may be to determine how long the benefit of a CYCORE intervention could persist. They also hope to implement the CYCORE intervention in non-academic cancer treatment settings where the majority of cancer patients receive their treatment. 1American Cancer Society. Cancer Facts & Figures, 2018.